At the beginning of this post I would like to clarify you why we do all of this. Some people say that the security tips like changing admin login, replacing database prefix, protection of wp-config.php is a waste of time and has no effect because eveything is already protected in WordPress by default. And I want to say – yes – WordPress is very safe and in ordinary situation, when you use clean WordPress install with the default Twenty Seventeen theme you have nothing to worry about (unless your password is «querty» or «12345678»). But there are no ordinary situations in life – you may use a plugin with vulnerabily or not good enough hosting — in this case any of security tips matter and could safe your website. 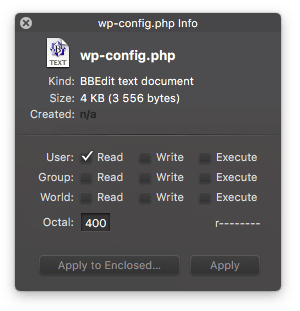 First of all – place your wp-config.php in the directory above your installation folder. Do not worry – WordPress will find it without problems there. Second – in the same directory create a file named .htaccess with the following content. On the screenshot public_html is the directory with WordPress. Third – set file permissions (chmod) to 400. You can do it in your FTP/SFTP client usually via right click on file. But what means 400 (or 440 and 444 as well) ? It means that nobody can edit this file. You can not even do it in your WordPress admin area (using a plugin for example). I also recommend to set 444 chmod for every .htaccess file on your website. In addition, the official WordPess codex recommendation is 755 for all directories and 644 for files. Usually WordPress already includes empty index.php file in /wp-content/plugins/, /wp-content/themes/ and /wp-content/uploads. But what about all the other directories without index.php, even like /wp-content/uploads/2017? Now, when someone tries to access your dirs directly, he will receive «403 Forbidden». Well, uploads directory is a very problematic place in WordPress. If it seems like your website is under attack, look into the uploads folder, I suppose you can find something interesting there. Our task now is to disable PHP-execution there. There are two ways to implement it (I prefer the first way). No matter what way you choose, you have to create another .htaccess in you uploads directory. In this method, by adding two simple files in your /wp-admin directory you will completely block everything inside it from unauthorized access. AuthName "Hi, this area is protected!" This is the content of the /wp-admin/.htpasswd file, each line is the user:encrypted_password. To generate the passwords you can use my tool. Protection by the IP is better, but it doesn’t fit for me because I work from many different places and sometimes in my trips. The interesting thing is that when you block your /wp-admin directory, the admin-ajax.php file will be blocked as well. So, you can not run ajax scripts outside your admin area. Awesome article with very practical .htaccess codes! Hey Misha really helpful article but I have some trouble to implement step 3 to hide/protect the WordPress Upload folder. Did I understand correctly – you would like to block all the files in your uploads directory? It will take some time to disappear from Google.